What to know: Completely charming show that teaches kids about the natural world. To start off, I want to comment on how The Cat in the Hat Knows a Lot About That: Season 3, Volume 1 and the rest of this series impacts children in a positive way due to the vocabulary and other lessons taught in each episode. This series is very enjoyable for kids to watch since the plots are well prepared in a way that kids can both understand and relate to. I didn't follow The Cat in the Hat when I was younger, but I feel it is very attracted to its target audience. The way the show is made, with all the colorful objects and the plots that draw you in is quite interesting. 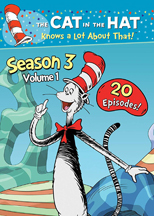 Enjoy the first volume of the third season of The Cat in the Hat Knows a Lot About That! The award-winning television show follows the adventures of 6-year-old best friends, Sally and Nick, as they're whisked off on amazing voyages of scientific discovery with the Cat in the Hat. Thanks to the Thinga-ma-jigger and our friends, exploring has never been more exciting! In this volume set, kids will learn how accidents and mistakes can lead to discovery, how the shape of an object impacts the way it bounces, and how changing the direction of a force can make heavier things easier to move. But the discoveries don't end there! We learn how mirrors reflect and bounce images, how to change the volume and pitch of a sound, and much, much more! So let's go, go, go, go on an adventure - we're flying with The Cat in the Hat today!